In my defence the bulk of my possessions are clothes, shoes and books so it’s not perhaps as ridiculous as it initially sounds. Having somewhere to store clothing and accessories, along with make up and beauty products, from the start will mean that I’m no longer rummaging through suitcases and boxes to match up a pair of shoes and will hopefully mean no more panic buying of underwear four hours before a flight leaves because I’m unable to actually locate any of my own. 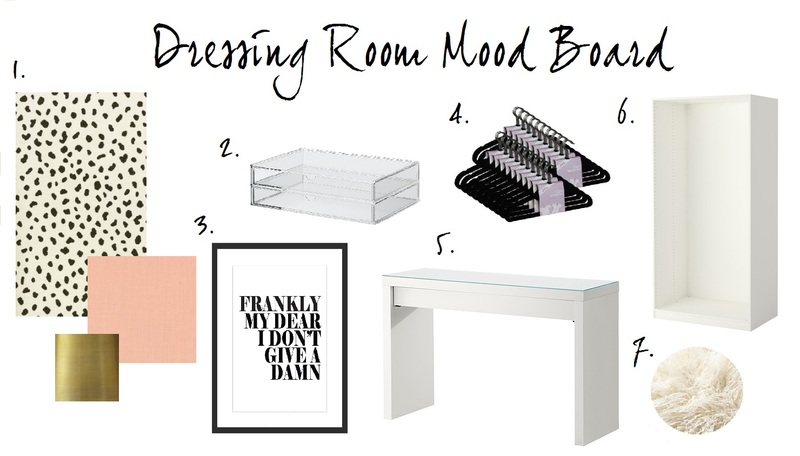 Before moving I spent many a happy hour browsing on Pinterest at amazing dressing rooms. Huge rooms devoted to wardrobe after wardrobe of clothes and accessories, not to mention the utterly swoon worthy shoe closets. Be still my beating heart. My obsession with the Thibault Tanzania wallpaper is a long-lived one and this Tiffany Richey designed office mixes that with a little bit of gold. My inner magpie adores this. 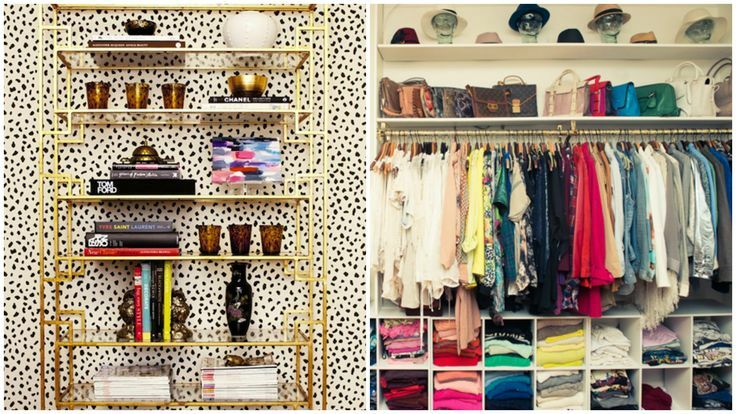 I love the open storage concept Aimee Song uses – if I can’t see it, I just don’t use it. It’s as simple as that, so this is definitely the route I want to go down. Finally, shoe closets. 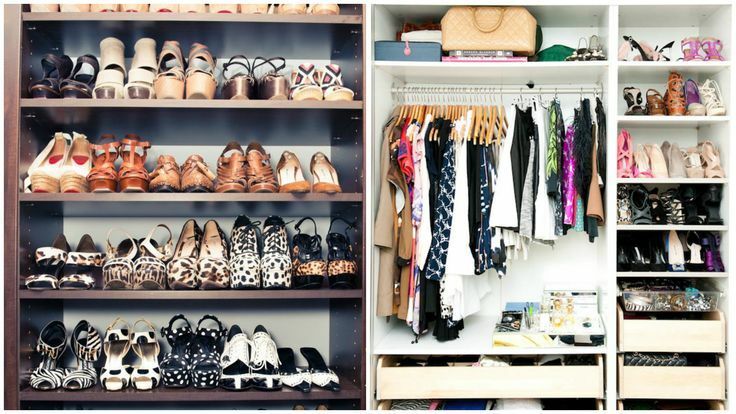 Ohmygod, shoe closets. Love. Need. Want. The reality is, the space I have to devote to all things frivolous is a mere 2.2m x 2.1m so this little room is going to have to pack some serious punches in the space saving and organising stakes. Thiabault’s Tanzania wallpaper is a must for me, paired with hints of coral and brass. It’s not cheap but I’m planning on only putting this on one wall and as the room is so small I should only need one roll. Muji’s acrylic organisers. Yes, everyone has them but that’s for a reason. They’re great for make-up storage and visually light. Love this print. I bought this from Etsy (the seller I bought from is no longer on there, but if you search on Etsy similar prints come up), I just need to get around to framing it. Matching hangers = successful adulting in my book. Time to chuck out the mismatched plastic hangers and invest some of these. I’ve heard velvet covered hangers work wonders at preventing clothes from slipping off the hangers (a true #firstworldproblem but frustrating nonetheless!) so I’m going to invest in some of these. IKEA’s MALM dressing table. Again, everyone seems to have this but I’m yet to find anything else I like with a large enough drawer for storing my make-up in. More IKEA. PAX wardrobes are about the most cost effective out there, are well proportioned and give you the ability to fully customise with rails, shelves, drawers and baskets. Sold! The dressing room has laminate wood floors and it doesn’t make sense to change them as so little floor space will remain once I add in wall to wall wardrobes. A sheepskin rug will help cosy things up a little and hide the nasty laminate! Any essential dressing room requirements I’m missing?